The sermon Jamie Rasmussen preached on Sunday is entitled “Helping Those Who Have Fallen.” Based on Galatians 6:1-5, this sermon continues the in depth look at the book of Galatians, written by Paul. This scripture passage looks at how to handle dealing with people who have fallen due to circumstances or sinful choices. Paul also gives a warning along with the instruction to help others. We must keep watch over ourselves to be sure that we don’t fall into temptation in the process. We are to remember that we’re nothing without Christ, and when we step into help, we are to let Christ shine through us. Those who are spiritually strong must help those who have fallen. Bear BOLDLY. Jamie broke down the Greek words behind the passage. We learned that what Paul is addressing is a person that is caught by sin or burdened by circumstances of this world. Not caught by surprise, but more like being caught in a cycle of sin. When a person needs someone to help is when that burden is simply too heavy to bear alone. As the spiritually strong person, we are to help with grace mixed with tangible relief. Bear WISELY. We’re human beings. As such, we live in the flesh and are not beyond temptation. It’s important for us to be wise about how we help. We’re to come along side of our hurting brother or sister, but not in a way that will be harmful to ourselves. Bear HUMBLY. Our ability to help is not because we’re so great. It’s because Christ within us is! Pastor Jamie gave us 3 points on HOW to help someone in need. Listen. We tend to be advice-givers, trying to fix the issue, problem, or thought process. Jamie points out that hurting people often need someone to listen – to care. Provide tangible help. When we can we are to give of our resources as the situation calls for. Whether that means helping someone with financial assistance, our time, our efforts, or connecting them to a needed resource. Pray. Pray with the hurting person when they are speaking with you, then continue to pray for that person. 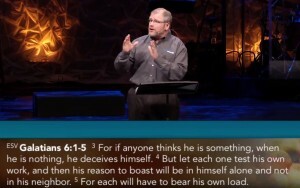 Pastor Jamie ends the sermon with a video (click here to watch). It’s a perfect example of what it looks like to care for others. It also shows how doing so not only effects their life, but it effects your own as well. He also goes through the difference between burden and load. Within this passage, we’re told to help others with their burden, but to carry our own load. It sounds like a contradiction, but it’s not. In the original text, the word used for burden shows an off balance weight. This is too heavy to carry. The word used for load refers to a proper burden. It’s not too heavy for one person to handle. We will all go through times when we are spiritually strong. These are the times we are to reach out to others and help however we can. We will also go through times when we are weak. Circumstances happen that are beyond our control. Temptations come our way that we fail to resist. We are only human. One of the takeaways I got from this sermon isn’t just in the importance of helping others. It’s what was unsaid, but is the natural flipside of this sermon. Any of us can find ourselves on the weak end of the equation. When we are, we NEED to reach out to others. In our culture, we tend to pretend that everything’s just fine even when it isn’t. ESPECIALLY when it isn’t! If we find ourselves with a burden too heavy to bear alone, we need to reach out. Or at the very least, we need to be receptive when someone offers help.